To effectively build Smart Rustenburg, RLM cooperated with multiple companies such as Electronic Connect in South Africa, Huawei and its parters. The project aims to develop the economy, enhance citizen participation, improve public safety and transportation, expand the scope of government services, and implement digitalized public utilities through leading technologies. In front of a school gate in the city of Rivas-Vaciamadrid, a child was missing,Less than half an hour later,the police officer in Rivas found the child by using eLTE Broadband Trunking Solution.How did they do that? Based on the physical requirements of the street circuit, Huawei provided an all-scenario Wi-Fi solution that solved network issues that had been encountered previously. The Huawei solution satisfied SGP’s requirements for high-density, multiple-user access, reliability, security, and environmental requirements to deliver the ultimate Wi-Fi network experience for users. The government hopes to use new ICT technologies to better equip the Mauritius Police Force (MPF) and Ministry of Public Infrastructure and Land Transport to apply proactive monitoring, early warnings, unified communications, and crisis management.Huawei proposed to help Mauritius build an all-cloud Safe City based on the concept of ‘one cloud and one pool’ to bring the digital world to every corner of the island. In 2016, ICBC (Asia) started to plan and deploy innovative systems by using the latest ICT technologies like virtualization, Big Data, cloud computing and DevOps by phase. With the help of new architectures, ICBC (Asia) secured an advantageous position for future market competition. Based on ICBC (Asia)’s business and technology development requirements, Huawei provided a number of cutting-edge solutions, such as the Digital Multimedia Banking Solution, the Safe Financial Cloud Solution, and the CloudFabric Cloud Data Center Network Solution. Widiba is an online banking arm of MPS, in recent years, Widiba has intensified its technological innovation. Aiming to build a one-stop financial service platform to serve high-value customers, Widiba chose Huawei as a partner to build a future-proof IT data management platform. CMB's commitment to a customer-centric concept. With the slogan 'We are here just for you,' CMB bear in mind that providing good services for customers， use FinTech to facilitate the business operations and better serve its customers,and use every technology to satisfy customer needs, improve customer experience, and create larger value. Its goals are more benefits, greater convenience, faster service, and considerate services for customers. Huawei has given CEM great confidence in ensuring network communications, automation and reliability, the operational efficiency has been boosted. CITIC Pacific Mining (CPM) is responsible for the management, construction, and operation of the Sino Iron project at Cape Preston,which is one of the largest magnetite mining and operation projects in the world. CPM and Huawei are exploring how to capitalize on digital platforms in order to affect their digital transformation strategy. Lundin Norway worried its current storage architecture cannot meet its fast growing data storage requirements. The tiered-storage features of the Huawei OceanStor 9000 solution specifically addresses Lundin’s requirement to manage hot and cold data separately, improve storage efficiency and data analysis, and boost processing performance. Air China upgrades their flight operations with the installation of a new video conferencing network supplied by Huawei. Huawei deployed an optical transport network (OTN) using dense wavelength division multiplexing (DWDM) for Austrian Federal Railways (ÖBB). Compared with traditional 100G networks, the DWDM technology enables better network performance and faster expansion of the broadband system. Huawei's products customized for ÖBB provide a transmission rate of up to 100 Gbit/s and have been deployed at multiple sites in Austria and Germany. Shenzhen Airport Group aims to become a global leader in airport operations and support the development of the Greater Bay Area. Huawei and Shenzhen Airport are following the ‘Platform + Ecosystem’ strategy to build a future-ready digital platform, and to deliver an efficient airport experience. The Huawei cloud data center solution helped Ruili Airlines build an advanced private cloud that has reduced the rollout time for new services by 50 percent. Rich cloud applications now allow Ruili Airlines to fulfill complex resource allocations at lower costs，and serve more passengers by supporting the continuous improvement of the ticket booking and passenger experience. Huawei collaborated with its partners to deliver the first BMW Group-Huawei project for ICT infrastructure, marking the successful delivery of the BMW Group’s first HPC server cluster in Sweden. After going online, the system has been running stably. Huawei has demonstrated its strength through successful first project delivery. Since its deployment in BYD's core service systems, including the enterprise, distributor, customer relationship, extended warehouse, and business intelligence management systems, Huawei OceanStor Dorado All-Flash Storage has proven to be stable, reliable, and robust. Over the years, these systems have seen a 5-fold boost in efficiency. Huawei and Audi have achieved a major milestone by embedding Huawei’s Mobile Data Center (MDC) into one Audi Q7 prototype vehicle, able to perform level 4 highly automated functions. Converge ICT is a leading player in the all-optical broadband access industry with licenses for operating fixed networks in the Philippines.Huawei proposed its Agile WAN Solution to Converge to build a Fixed-Mobile Convergence (FMC) 2.0 network,which will help Converge construct an intelligent, ultra-broadband, and simplified network. Huawei Intent-Driven Wide Area Network (WAN) Solution can help Biznet cope with even the heaviest traffic, so new travel and ticket retail websites do not need to worry about network connection faults. Enterprises can then focus on core services like providing high-quality travel routes and cost-effective tickets, and improving the browsing and purchasing experience. With the help of Huawei's CloudFabric solution, CyberAgent, Inc. successfully built a cloud data center network with Intent-Driven Network (IDN) capabilities and comprised fully of fixed switches. The construction of this next-generation cloud data center effectively meets the growing requirements of CyberAgent, Inc. in areas such as media, Internet advertising, and gaming, maximizing their business value. The 4K is starting to catch on into the media entertainment market and broadcasters or production companies need to face a certain level of challenge. It was not possible until now to really work around the constraint of producing live television with 4K with current technology. Huawei's media cloud enables TF1 to provide HD video streams for clients. The whole process requires no advanced client devices or powerful, HPN-based back-office support abilities. Huawei works with Mediaset to build a new network infrastructure, support its IPTV strategies, improve performance, and bring more market opportunities. To enhance future competitiveness, EPFL has planned to upgrade and expand its HPC system since last year because resources are insufficient.Huawei repeatedly conducts detailed analysis and figures out a solution，which has 408 FusionServer XH620 servers deployed as compute nodes. Universities around the world are asking the following questions: How can we save costs and improve communication efficiency? How can we quickly build communication capabilities that align with our teaching requirements? How can we improve the teacher/student experience?The answer to SCU’s questions was to deploy the Huawei Cloud Enterprise Communications (CloudEC) platform to build a high-quality teaching and office communications network. ETH members expect stable, high-performance Wi-Fi for their mobile accessibility and connectivity. These needs and requirements will continue to increase. With its quality products and flexible, fast processes, Huawei is a reliable partner for the future to efficiently meet these requirements. With cloud and machine learning technology, Philips and Huawei released a joint solution to improve healthcare efficiency and accuracy. With its scientific teams producing increasing amounts of data, Helmholtz Centre needed to find a cost-effective replacement for its ageing storage system.After a comprehensive evaluation of the responses received, it was clear that the Huawei based solution offered by IT Systems Integrator, microstaxx more than fitted the bill. Unieuro is the largest omnichannel distributor of consumer electronics and household appliances by number of stores in Italy. It requires a Wi-Fi solution that can achieve 100% coverage，and be an online-offline integrated marketing tool as well as an open platform. In the cloud and IoT field, Huawei and SAP extend their cooperation, conduct innovation in industrial solutions, and help customers achieve business success through digital transformation. Deutsche Telekom chose Huawei as the hardware and software provider of its open telecommunications cloud. Huawei implements ICT infrastructures on public clouds, faithfully serves Deutsche Telekom as its best partner, and helps Deutsche Telekom offer safe, reliable, cost-effective, and easy-to-use public cloud services. Telefónica and Huawei jointly launch the Open Cloud public cloud service to fulfill the business requirements of Andreani, and work out a customized three-step cloudification plan: e-Commerce cloudification, SAP network delay reduction, and core warehousing system DR cloudification. At present, the overall project enters the second phase. Huawei’s digital transformation equips enterprises with efficient operations for better development. Currently, Huawei has achieved digital transformation in nine core business domains, including R&D, sales, delivery, and logistics,and we hope our experience can light the digital paths for other enterprises, including partners and customers. Over the last few years, digital transformation has become an industry megatrend. Enterprises use ICT technology to improve working efficiency, create business innovations, and provide better customer service.  This has resulted in a number of success stories of improved customer satisfaction and company earnings that we have published in our ICT Insights magazine. Do you have such stories? Will you share them with us? Please fill in the following form, and we will contact you soon.